On Launch Pad 39A at NASA's Kennedy Space Center in Florida, workers removed the vent line attached to the ground umbilical carrier plate on shuttle Discovery's bright-orange external fuel tank. A hydrogen gas leak at that location during tanking for Discovery's STS-133 mission to the International Space Station caused the launch attempt to be scrubbed Nov. 5. This storywas updated at 2:18 p.m. EST. 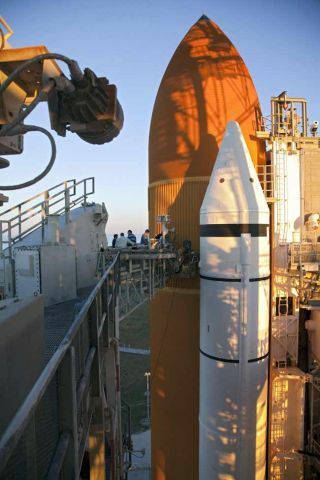 NASA has postponed the launch of space shuttle Discovery'sfinal mission to no sooner than early February ? the latest in a long string ofdelays that have kept the spacecraft grounded for over than a month. Discovery is now slated to launch no earlier than Feb. 3,giving NASA engineers more time to complete work to analyze why smallcracks developed in the shuttle'shuge external fuel tank. The cracks have since been repaired, but NASAwants to be sure that similar issues don't pose future concerns. "The teams have done a very thorough job of looking atthe data at hand, but we're coming to a point in the investigation where wehave to do something different," NASA's spaceoperations chief Bill Gerstenmaier said in a news briefing today. If Discovery is ready to launch in early February, NASA willhave from Feb. 3 to Feb. 10 to attempt a liftoff within that window. Engineers at NASA's Kennedy Space Center in Cape Canaveral,Fla., have been performing tests and gathering data to try to determine whatcaused the cracks that were found on the metal ribs of the shuttle's externaltank. Yet, even with the extensive amount of available information, the teamshave been unable to clearly identify the root cause. "We're at a point where there's no obvious answer as towhat occurred, and what that means is that we have to take the next step,"said John Shannon, NASA space shuttle program manager. "We have to do thatthrough demonstration. Analysis is not going to get us there. Analysis can onlyget you so far ? it's time to go test." NASA will now perform a fueling test, in which gauges and otherinstrumentation are attached to Discovery's external tank as it sits on thelaunch pad. This will allow technicians to gather precise measurements of thetype of stress exerted on certain areas of the tank as it is loaded withcryogenic propellant. Engineering teams will be able to monitor how the repairsstand up to the harsh thermal conditions during tanking, and whether or not similarcracks form in the process. "Understanding the thermal environment is critical tounderstanding the stress level in it," Shannon said. "We have to goto that next level and really understand the problem. This will also help determinewhat our screening criteria [are] to fly the tank confidently." NASA officials said that the delay until February will notnegatively impact space station operations, other shuttle launch opportunities,or the space agency's budget. "We have sufficient margin to go ahead and work all theactivities from a budget standpoint," Gerstenmaier said. "We haven'treally pushed or upset anything from an overall budget standpoint." If Discovery launches in early February, the final flight ofspace shuttle Endeavour ? the STS-134 mission ? will likely move from itsoriginal Feb. 27 date into early April. Discovery's launch has been delayed since early November dueto technical and weather-related issues. The shuttle's planned 11-day missionwill deliver a storage room and Robonaut2, a humanoid robot, to the International Space Station. Two spacewalks arealso planned. The mission will be the 39th and lastflight for Discovery. It is one of NASA's two final scheduled shuttleflights before the orbiter fleet is retired in 2011. NASA is hoping to launchan additional shuttle flight around June, but is still awaiting final fundingapproval from a congressional appropriations committee.